We never left, however for the last year we have been feverishly working to upgrade all of our Programs to High Definition. We have been adding new scenes and overall improving the programs for you. We will start reintroducing them now that we have many of them ready for publishing. Each of the new upgraded program announcements will be posted here. So be sure to subscribe to our posts. We have kept all the Bob and Penny Lord audio and video intact. However, we have add new high resolution scenes wherever possible along with other editing upgrades. away as so much dust? Jean-Baptiste prayed, as did all in the household that evening. was brought back to his home, that solid building where he would spend the next few years of his life. We visited that house in 1977.
the presence of the Saint in that house, as much as we could in St. Laurent-sur-Sèvre, where he took his last breath in 1716. Jesus in the Tabernacle and on the great and wonderful Altar of the Church. worked with his piety; our Lord Jesus turned his anger to zeal for his Mother and the Church. in the Jesuit College in Rennes at 11 years old! That time was excellent training for Louis, especially for the work ahead of him. influence our walk towards the Kingdom. We break here for a moment to give you two solid examples of how this has happened that we know of: Once in the life of St.
Louis Marie de Montfort, and once in the life of our Pope John Paul II. on the part of the priest. He was enrolled in the Sodality. Our Lady, he already had all the resource background given to him by guess who? Our Lady! writings of Louis Marie de Montfort. Today is the Feast day of Saint Louis Marie de Montfort and we want to share with you one of his prophecies about the last days. “They will have the two-edged sword of the Word of God in their mouths and the bloodstained standard of the Cross on their shoulders. They will carry the Crucifix in their right hand and the rosary in their left, and the holy names of Jesus and Mary on their heart. 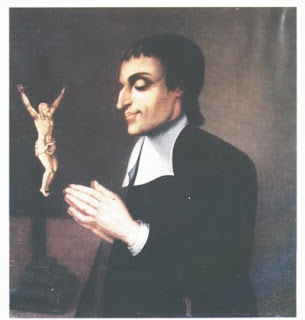 Thank you Jesus and Mary for St. Louis Marie de Montfort. For information on our dvd on St. Louis Marie de Montfort, click here. You are currently browsing the archives for the Saint Louis Marie de Montfort category.